Who? 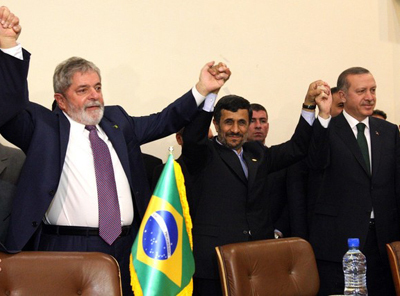 President of Iran Mahmoud Ahmedinezhad signed an agreement brokered by Brazilian President Luiz Inacio Lula da Silva and Turkish Prime Minister Recep Tayyip Erdogan. What? Iranian regime would ship low-enriched uranium to neighbouring Turkey in exchange for nuclear fuel. The fuel would be used by Iran’s nuclear plants to generate power for civilian purposes. Where? The deal was signed in Tehran, Iran. When? The agreement took place on Monday, 17 May. Why? Iran has agreed to transfer 1,200 kg of its low-enriched uranium to Turkey within a month in return for higher-enriched nuclear fuel for a medical research reactor. The country is under pressure from U.S. led U.N. Security Council which is threatening to impose sanctions if Tehran continues uranium enrichment on its own. How? Brazil and Turkey, both non-permanent members of U.N. Security Council, oppose sanctions on Tehran and combined diplomatic efforts to broker a deal. Iran will get 120 kg of 20% enriched uranium under an arrangement involving the IAEA, as well as the U.S.A, France and Russia within a year.